The fleet awoke to find the sunshine beating down on the boats again. It was going to be a hot one. Today crews would enjoy a rest day in St Peter Port, Guernsey. 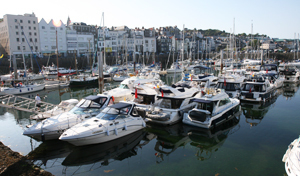 Photo – the fleet assembled in Victoria Marina, St Peter Port. 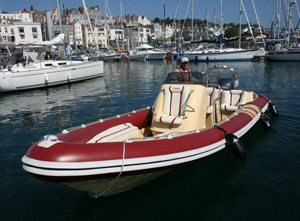 The MBM staff had laid on RIB rides over the Herm island and they were skippered by local boy Richard Poat. Thirty people were ferried across to Herm on three return trips. They all spent 2 hours exploring the sandy beaches and rocky coastal paths of the idyllic island. On each journey over Richard displayed his knowledge of his tricky cruising grounds, taking routes through rocks and giving everyone the opportunity of seeing the puffins. Back at Victoria Marina St Peter Port, other crews stayed aboard their boats and basked in the baking sunshine. Other crews decided to get their feet on dry land and explore further afield. The crew of Cranchi Zaffiro 34 Get Passionate took the bus around the entire island, in search of sandy beaches. For the MBM staff today was good opportunity to catch up with the extensive jobs list, some requiring tools, some knowledge. Two of the slow boats, Grand Banks 42 Endura and Mainship 390 Cartovi waved goodbye to the fleet today. Unfortunately they had to break away from the cruise early as they needed to get home early on sunday. Later in the evening they reported in that they had arrived safely back in the UK and were now in Cowes. Photo – Job well done. Richard returns from his Herm trips. A big thank you to Guernsey man Richard from the MBM team and the whole fleet. A skippers briefing was held on the pontoon at 1800 and Neale informed everyone of the plans for the next couple of days. Carteret is on the agenda for tomorrow however the weather forecast for sunday is not looking ideal for a passage home across the channel. They are predicting stronger winds, Force 4-5’s and thunderstorms. Neale will look at the weather again in the morning and unless the weather for sunday changes dramatically overnight he will recommend that the fleet make for home tomorrow.